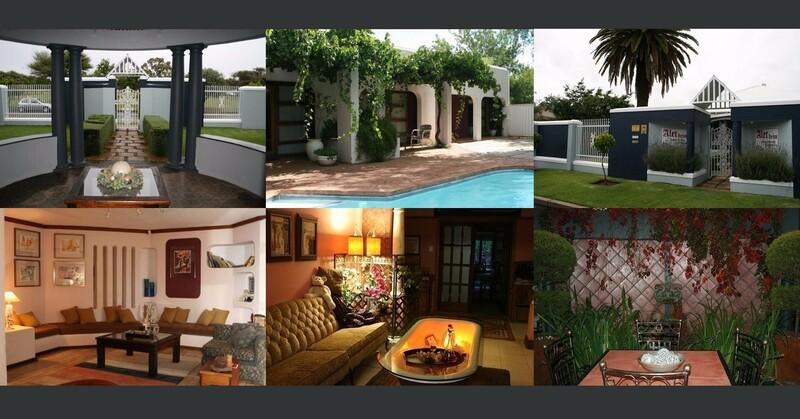 Those in search of warm, romantic decor and picturesque gardens will find it at Aletheim Guest House Collection (B&;B/ Self Catering). Aletheim Collection comprises of 59 Milner St, 57 Milner St, Carrington Court Town House and 6 Steenberg Avenue. Choose one of 2 fully equipped garden cottages, or the en suite bedroom in the main house (with its own private entrance). 57 Milner St (House Yada) Fit for a King and a Queen. Eight en suite bedrooms. Feel at home in this spacious beautifully decorated old house with 4 large en suite bedrooms, lounge and dining room as well as two smaller en suite rooms with private entrances. Ideal for Groups and Families Also ideal for business people for enjoying their privacy. Carrington Court Town House. Situated in the historical Carrington Road. A fully equipped townhouse with lounge and kitchen, 3 en suite bedrooms. This guest suite consists of two bedrooms, one en suite bathroom with bath and shower, lounge and kitchenette. Your hosts Johan and Alet will welcome you to Kimberley.